I like to check out the manufacturers pages every once in a while to see if they have come out with something new but never sent out a press release for. 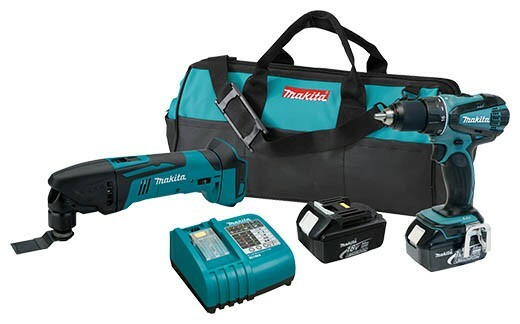 When I checked Makita's page a few days ago I was surprised to see that they have added two 18-volt oscillating multi-tool combo kits to their LXT cordless line. The LXT246 cordless combo kit includes the LXMT02Z oscillating multi-tool, the LXDT04Z impact driver, two of Makita's BL1830 lithium-ion batteries, a DC18RA 30-minute charger, and an 821016-X contractor bag. The LXT245 cordless combo kit includes the LXMT02Z oscillating multi-tool, the LXFD01Z ½" Drill/Driver, two BL1830 lithium-ion batteries, a DC18RA 30-minute charger, and an 821016-X contractor bag. Currently they only have 2-piece bundled kits, but there is always a possibility for more. Personally, I think a 3-piece kit that includes the multi-tool and both a drill and impact would be a nice bundle option. Both two piece kits are listed at $320 at CPO Makita, but they are currently unavailable there or from Amazon. 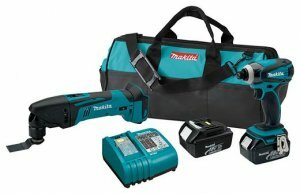 Until the end of March 2013 both kits (as well as other kits) are eligible to get you a FREE battery OR FREE bare tool as part of a Makita promotion. This makes the 3-piece set possible right now. See Makita for complete details.